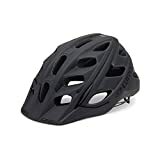 The Giro Hex Mountain Bike Helmet is a tough product designed to be rugged, sleek and performs impressively, offering good value for money. It features the technologically advanced ROC Loc system which has been refined for better fitting properties over the years. It provides an unparalled level of stability, lightweight, comfort and efficient adjustable properties. With this technology, you can adjust the tension and vertical position for a better fit easily and with just one hand. It comes with a ratcheting dial that has micro adjusters which can be operated by twisting and this opens or closes with a loud click, a retention system. Vertical position adjustment is achieved via a three position bracket with fifteen millimeters of accurate vertical movements and this system can be adjusted with the helmet on the head. It employs a super fit engineering system that consists of durable arms crafted to be comfortable and works seamlessly with the eyewear from Giro. The straps are thoroughly woven and are positioned perfectly to provide a proper and comfortable fit without rubbing against the face. During tests carried out on this superb helmet, it performed excellently for six thousand six hundred cycles which is the equivalent of three years of usage. Constructed with the in-mold technology for the lower and upper part thus providing a durable and efficient protective characteristics. Massive twenty one air vents strategically positioned to provide for efficient entry of cool air and expulsion of warm used air. The all new Roc Loc 5 technology which provides a seamless means of adjustment for a better and tighter fit. The Giro Hex Mountain Bike Helmet is a stylish helmet that comes with basic protective features. It uses the ROC loc 5 system which boasts of simplified adjustable characteristics and the straps are one of the bests available. It provides excellent ventilation, fits perfectly, does not feel too bulky and protects well against falls. The air flow system works effectively as the twenty one vents are properly distributed around the helmet. With few clicks and twists, you get a perfect adjustment for any head size and shape that fits tight and doesn’t wobble. The sun visor does a good job of protecting the face from sun glare and it’s built tough. This helmet is reasonably priced and looks like a product that will outlast the price value. For a confident protection, it comes recommended to every biker.